Sun at last! I draped all my clothes and wet things around on hedges, my bike, etc and and attempted to dry them out. I stayed till 12, after which, if you are still on the camp site, it costs another day, no thanks! A few miles down the road the Pyrénées come into view and the road gets a lot hillier. 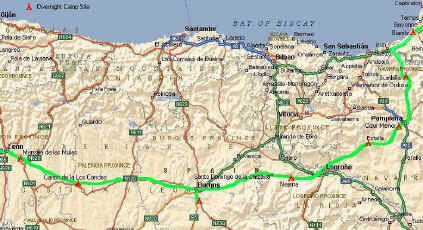 I rode down the coast through St Jean de Luz and Hendaye and then inland to Irun, finally in Spain. It was a Sunday and I was grateful that Kath had said “take some pesetas with you in case you arrive in Spain on a Sunday”. I sat down at a local cafe and ordered something called revuelta de atun it turned out to be a runny tuna omelette. It was horrible and must be where the word revolting comes from. Andre, a Belgium, sat down on a nearby table and we started chatting about various things. It turned out that he was on the way to the south of Spain for a friend’s wedding and having endured the same awful weather on his motorbike through France he had started to have fun on the Spanish mountain roads when the sun appeared. Too much fun as it turned out as he had approached a corner too fast, lost control and written off his 1000cc Kawasaki. He had also hurt his knee and elbow and was all bandaged up. He had sent what was left of the motorbike back to Belgium on the train and was about to leave for home that night. He was, as you might expect, very very pissed off about the whole thing especially as his girlfriend of many years had left him just before the trip and the bike he thought may not be insured in Spain. I managed to convince him things were not that bad, he could have killed himself for instance, or worse, chosen revuelta de atun omelette at this cafe and why go back to Belgium on the train when he could continue to the wedding on another train and perhaps meet a new girlfriend there? The rest of the afternoon was spent chatting about destiny, the chaos theory and South America where it turned out he had spent two years and knew most of the places I had recently returned from. He had also been on the pilgrim route from Pamplona to Santiago de Compostela, something I had thought about doing but the weather of the last week had put me off . I was heading for Santander and the ferry home. The result of the afternoon’s chat was that I decided to attempt to cycle the Camino de Santiago after all and he changed his train ticket from Belgium to the wedding. I set off at about 6pm towards Pamplona, having bought a map at last in a Shell garage (appropriate maybe as the Shell logo and the scallop shell emblem of the Camino de Santiago pilgrim route are not dissimilar). The map was useful as it showed Pamplona is known as Irunea in this part of Spain (Basque thing I think) and I had wondered why I had not seen any signs to Pamplona. I followed a very pleasant river valley up into the mountains on the N121A road for a couple of hours, thinking that this would be my first night without a camp site, but no, just as I was about to give up and camp by the roadside a camp site appeared at Sumbilla. It turned out to be the best campsite so far, on top of a mountain, loo paper, good showers (how do they get water up there?) a good and cheap restaurant and wine at £1.04 a bottle (they had cheaper but I went for the best). Bliss ! I think I will stay here, maybe I will forget trying to cycle the the pilgrim path to Santiago. It was difficult to leave the great campsite at Sumbilla. It was in a lovely spot on top of a mountain with higher mountains all around.. There were cow bells (or perhaps sheep bells), sunshine and nice people running the place. I had another attempt to dry everything in the sun and borrowed some tools from the nice people to tighten up the nice front wheel cones as they had started to get a bit slack after 800 miles or so. (I was always told at school to use a better adjective than "nice" - but it is such a nice word). I set off at about 12 again, so much for the early start. The pleasant river valley soon became a serious hill, too steep to ride up (later having ridden up worse in northern Spain I would perhaps revise this assumption). It was a five mile uphill push and the weather was by now very hot. Lorries were also making slow progress and I tried hanging on to a couple of them to try and be "towed" up the hill but after a few hundred yards my arm gave up. On the climb up the hill there were two tunnels which were a bit daunting for a cyclist as there was no cycle track, the lighting was not that good and there were muddy slippery bits I could not see coming in the dark. In the second tunnel a pickup truck with flashing lights positioned itself behind me and stayed there protecting me from the following traffic. I assumed this was perhaps the tunnel police or something. Feeling guilty about the queue that was building up behind I rode as fast as I could but it was slightly uphill and the tunnel went on and on for what turned out to be about three miles. When we finally emerged the pickup sped off, it was nothing to do with the tunnel police just a private motorist who for some reason had flashing lights on top of his pickup. I suppose it was nice of him but I don’t think the 50 or so vehicles that had built up behind us in the tunnel thought so judging by the look on their drivers’ faces. Just outside the tunnel I stopped for a rest by some impressive horse statues by the road. After the tunnels it was more or less down hill to Pamplona where I saw the first Camino de Santiago sign Pamplona is a much larger city than I had imagined, rather modern on the outskirts with lots of blocks of flats. The centre is old with narrow streets, castles and amazing old buildings. 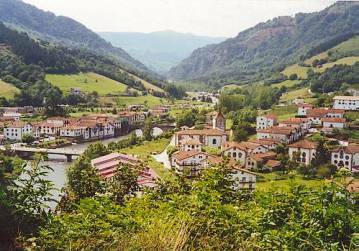 The whole is set in a large valley surrounded by mountains rather like Santiago in Chile but on a much smaller scale. I looked around the centre for a couple of hours. They were still clearing up from the famous bull run event of two or three days ago. Judging by the piles of mess it must have been quite a party, most of the city being reminiscent of the marquee the day after the SAS ball. I saw some signs that marked the pilgrim way through the city and followed them to Cizur Menor, a small village a few miles South of Pamplona. The signs that marked the pilgrim way (camino de Santiago) were blue with a yellow representation of the scallop shell emblem of the pilgrims. There were also yellow arrows pointing the way on lamp posts, walls, stones or anything handy. There were two refugios for pilgrims at Cizur Menor both of which were full but I could put my tent up in the garden of one of them and use the shower and cooking facilities. 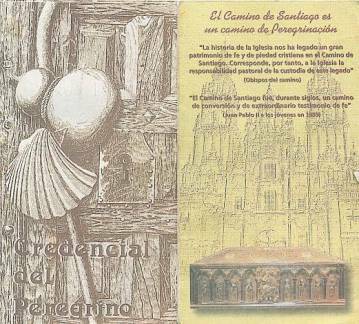 I was given my Credencial del Peregrino, a sort of pilgrim passport that is stamped along the way and serves as proof at Santiago that you have indeed followed the pilgrim route and deserve a Compostellana, The certificate awarded at the end of the journey. 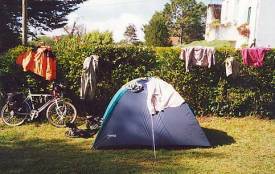 It is also required if one intends to stay at any of the refugios along the camino . I had a meal at the restaurant across the street. It was served very abruptly by the off hand waitress, so abruptly that I did not actually see the pudding being plonked in front of me, maybe I blinked or something. The meal was good value at about £3.00 for three courses including bread and a full bottle of fairly passable red wine. I had chosen lomo al plancha followed by flan. I was impressed (the food not the waitress) but later I would learn that in Spain a la plancha as well as a la romana and various other descriptions all seem to mean fried. Virtually all meals include papas fritas (chips) and a small salad, very rarely any "non salad" vegetables, (well never as far as I can remember). The food is a bit like South America but not as varied and with very few exceptions not as good. I would soon tire of fried food. I have to say that Spanish food in good restaurants is superb but beyond my daily budget I am afraid. The nice peaceful refugio garden that I had pitched my tent in had two drawbacks, ants and a nearby very loud church clock bell that belted (must come from the word bell I suppose) out throughout the night on the hour and then for some strange reason again at seven minutes past the hour, Basque summer time perhaps? Unless there were actually two very similar sounding clocks one of which was slow, or fast? Am I going mad? My first day as a bona fide pilgrim. I set off at about 9 am, long after the other pilgrims had left (mostly on foot) and I soon found out why they had left at 6 am or before. Gosh it gets hot after about 10 am, 33 degrees in the shade. I had been advised at the refugio to head South to Eunate rather than follow the normal route via Alto du Perdon. The route was partly on small roads and partly on the off road pilgrim track. It would have been easy going apart from the heat. There were a few hills but mainly a gradual descent through seemingly endless vineyards and distant mountains. I visited the church of Eunate about 20 miles from Pamplona. It was apparently built in the 11th century and used as a pilgrim’s burial place alongside a hospital run by the order of St John of Jerusalem. It was quite small and had fascinating windows with a sort of semi transparent stone instead of glass. 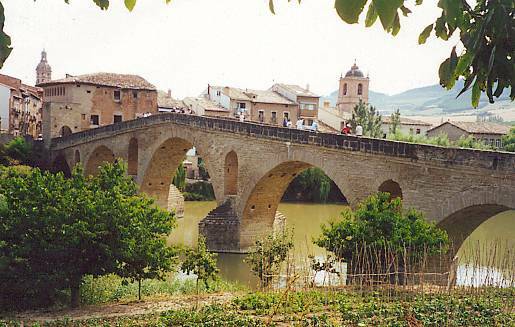 I arrived at Puente la Reina at midday with its famous medieval bridge and narrow streets. I looked around for an hour or so before setting off again in the burning sun. At about 2 o’clock it became too hot for me to continue so I stopped at Cirauqui for lunch. Cirauqui is a very old town built on a steep hill in the centre of a wide valley. There was a church at the top of the hill, no visible shops and it all looked a thousand years old, probably because most of it was. I climbed to the church and watched as thousands of swallows gathered around the church spire presumably getting ready for their long trip back to South Africa. Their formation flying amongst the buildings was most impressive. There was a restaurant at the bottom of the hill near the main road so I had a meal there for an excuse to escape the afternoon sun. It was the, becoming familiar, fried "something" with chips and a bit of salad followed by flan, which by the way, are small caramel custard things that feature on most cheap menus and usually come straight out of a fridge in their own plastic cup. There was also the usual full bottle of very passable red wine, which I drank. This might have been a mistake as when I set off again at about 5 o’clock I was feeling a bit light headed and it was still very hot indeed. Later I learnt that if one is alone at a table then one is really only supposed to drink half the bottle, oh well. Much later I learnt that the fried "something" was in fact a "Lomo" which apparently is a beast that features on most cheap menus in Spain but is very rarely seen running about. I arrived at Estella at about 7 o’clock. 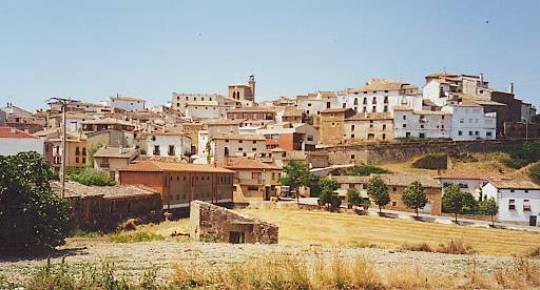 Estella is a beautiful old town set low in a steep valley within a large valley on the banks of the river Ega. Failing to find the camp site (as usual) I booked into the pilgrim refugio and set off into town to explore. 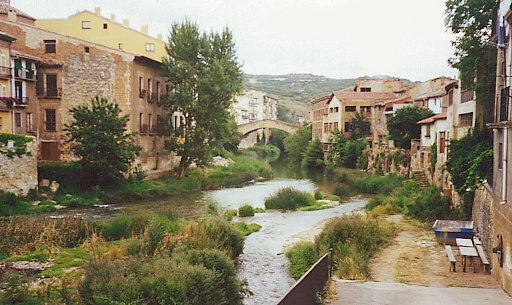 Again rather like Puente la Reina the town is very old and fascinating with narrow streets. 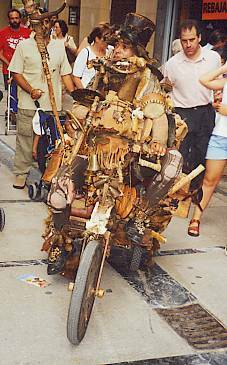 There was a large main square and some sort of medieval fiesta was going on with a lot of people dressed in medieval costumes, jugglers and other “shows”, one of which was a one man band dressed in skins on a three wheeled bike covered in junk and things. He must have had a non medieval synthesiser hidden somewhere but the resulting noise was enchanting, almost ethereal, as he played along and sang. I followed for about half an hour, fascinated, as did many others, mainly kids, perhaps a modern day pied piper? Unfortunately the refugios shut their doors at 10 o’clock which is too early as Spanish towns don’t come alive until about then so I missed the fun and the fiesta and for that matter even a meal as the restaurants don’t open till 9.30 at the earliest in Spain. This 10 o’clock curfew and perhaps also the fact that the night was spent in a dormitory with 20 other snoring pilgrims would mean that this would be my first and last stay in a refugio on the whole trip. Perhaps a third reason is that most pilgrims seem to leave very early in the morning, about 6, this means getting up at 5.30 or before – far too early for me! At this refugio the pet cockerel in the back garden made certain everyone was up at daybreak! Including me, from now on chicken will feature in my diet as often as possible.